Vinhos is my first Vital Lacerda game. As a eurogamer I had long wanted to try out a game from his hand. But for many reasons I had never gotten around to it. 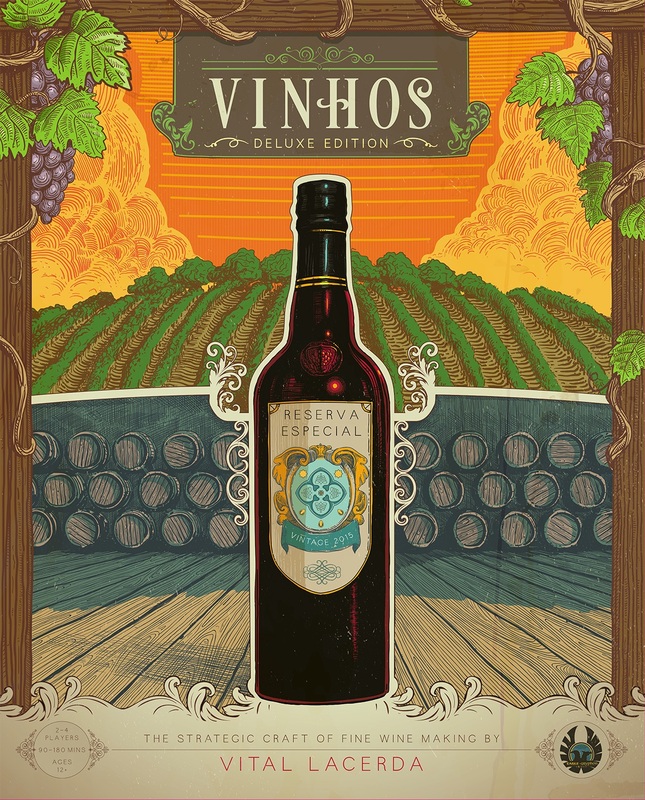 But when I got my hands on the Vinhos Deluxe Edition I couldn’t wait to get it to the table, anxious to find out if this heralded designer was something for me. In Vinhos you are striving to be the most profitable and famous wine makers in all of Portugal. You do this by developing your vineyards and employing experts to help you improve your wines. You should also remember to sell some of your wines (or you will run out of money quickly) and don’t forget about the wine fair! At the wine fair you send in your best wine for evaluation by experts and competition with your opponents. At the end of the game you will tally up victory points earned from victory points as well as points earned by exporting wines. The main action that you is to move a pawn on a 3×3 grid and take the action that the pawn lands on. These actions let you do various things such as buying more vineyards, construct wine cellars, hire experts or farm workers. All with the purpose of producing wines of better quality. You can also sell your wines to ensure your cash flow (the better the wine quality, the more money) as well as export your wines to gain victory points at the end of the game in an area majority sub-game. You produce wine once a ‘year’ – every other game round. When wine production happens, you produce on every wine area you have. Thus, having many areas means you have a far better yield. The quality of wine you produce is determined by how many vineyard, chateaus, cellars as well as workers of various kinds you control/own. Every action in the game cost money, so ensuring your money flow is of vital importance. You can REALLY put yourself in a tough spot that is almost impossible to get out of if you run out of money at the wrong moment. One action doesn’t cost you anything though: sending in a wine in for evaluation at the wine fair. The fair take place three times during the game. Sending in your wine before the other players allow you to decide what bonus you get when sending in your wine, but also means that your wine won’t get more time to develop. The person with the best quality wines at the fair will get a significant amount of victory points. As previously mentioned you take your main actions in the 3 by 3 grid. There are however, various ways to upgrade what you can do in a turn. This is important because in the entire game you only get 12 actions from the grid, so EVERY action you take counts. The game is incredibly tight with its actions and its money. 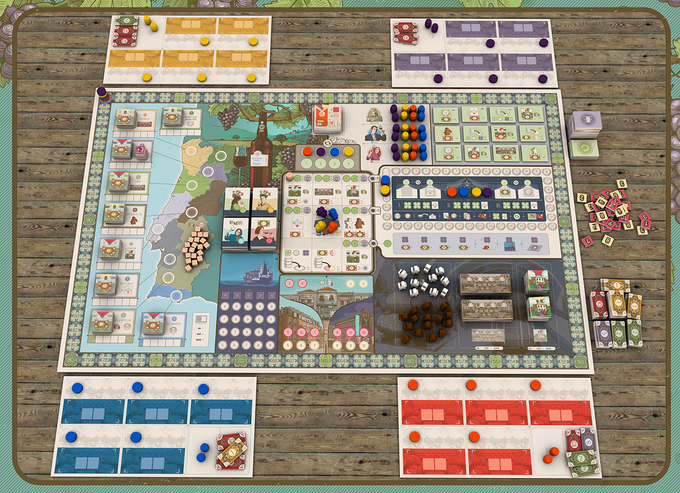 Vinhos is a game about balancing: You must balance your cash flow, you must balance when to send in your wines to the fair and when to send them to the export markets. Where should your wines of various qualities go – to the export markets, to the fair or should you sell them? Vinhos is a very deep and rewarding game. The theme comes through in a way I didn’t suspect initially. I felt that I really experienced how all the needs of a wine business must be balanced. Obviously on a very abstract level but one that is very intense. I frankly love this game much more than I thought I would. It is a heavy game in the sense that I feel like my brain has gotten a workout when I’m done playing. The ruleset isn’t very complicated, so the complexity is in the choices not in the rules – something I really love. The artwork is by one of my favourite game artists – Ian O’Toole. It is astonishingly functional while still being thematic and incredibly pretty. The components are among the best you will ever get in a euro game. This is one of the, if not the, best game I have played from 2016. Very deep gameplay that encourages repeated plays and rewards the ability to read your opponents. Some of the best components and artwork I know of. Variability in setup without losing the strategic nature of the game. Doesn’t outstay it’s welcome even though it is quite a long game – the turns zip by for the most of the game. After a game it feels like you’ve given your brain a good workout. The turns can get a bit long at the end of the game and with people who will analyse every possible move this could drag the game a bit. After a game it feels like you’ve given your brain a good workout, and it could possibly be way too much for some. This is a very deep and heavy game. The rules are not very complex (and quite well written). But the amount of information and options you have to juggle to play well is intense. Haha, wr00t 😀 I have an infinite respect for V. Dutrait and his splendid artwork :D! But it’s indeed nice that not all games look the same 🙂 The Deluxe Editions of Vital Lacerda’s games are true pieces of art!